The coffee king will plant a big flag in the coffee capital of the world. Editors' pick: Originally published Feb. 27. Starbucks (SBUX - Get Report) is certainly making up for lost time in the coffee-snob capital of the world—Italy. 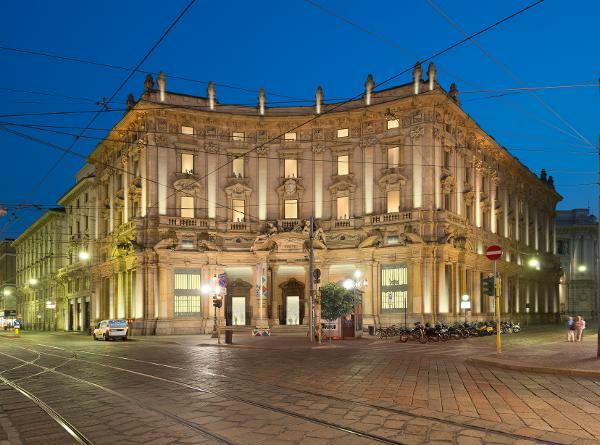 The coffee giant will open a statement-making, 25,500-square-foot roastery in the historic Palazzo Delle Poste in Milan late in 2018, the company revealed on Tuesday. When it debuts, it will mark Starbucks' first roastery in the European, Middle Eastern and African region, and its fifth international spot. For Starbucks Chairman and CEO Howard Schultz, the megastore in Milan brings the brand full circle. 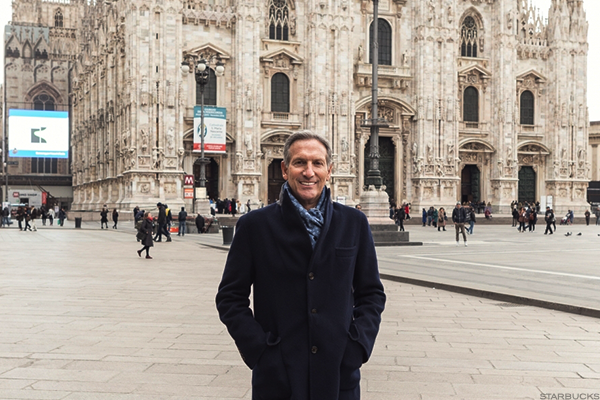 More than 33 years ago, Schultz took his first business trip to Milan and Verona, an expedition that ultimately led to the creation of Starbucks as we know it. Even though Italy, in many respects, is the birthplace of Starbucks, the company only last year announced it would partner with Percassi on shops in the country. Starbucks' hesitance to take that step in Italy could likely be traced to several factors. First is the intense culture that would have made it tough for Starbucks to have success instantly in the market. Coffee is at the heart of the Italian culture, with local mom-and-pop shops competing to sell cheaply priced espresso and cappuccinos. Most shops are places where Italians can grab a quick espresso and go about their business. In contrast, Starbucks encourages customers to hang out. Further, a majority of Italians prefer densely brewed expresso delivered in small ceramic cups, instead of the Grande and Venti sizes popularized by Starbucks. Secondarily, the market is saturated by coffee players, making it a slow-growth environment. In 2016, coffee in Italy saw retail volume sales decline by 2%, but value sales rise by 2% in current terms as people warmed up to purchasing more exotic drinks, according to Euromonitor. Coffee in Italy is expected to increase at a compounded annual growth rate of 1% in retail volume from 2015 to 2020, notes Euromonitor. Even so, Schultz now believes the time is right to tackle Italy. "The unaided awareness of Starbucks in Italy, and specifically in Milan, is very, very high. Thousands of Milanese customers have had a Starbucks experience in other European cities or in the U.S.," Schultz told TheStreet in an interview. "There is a pent-up demand for Starbucks in Milan like there was in Paris and other cities, where there was some doubt or concern that, perhaps, we wouldn't succeed," Schultz said, adding that he has a "high level" of confidence in Starbucks making it in Italy. Once the roastery in Milan opens, Schultz said Starbucks could open 10 to 12 stores in Italy over the course of the ensuing year. "Italy has some of the most discerning coffee drinkers in the world, and Starbucks really wanted to make sure that it could compete in this market. I think they can have success, as there's a lot more American-style coffee there now. But, even more, Starbucks' model was predicated on the Italian coffee shop," explains David Henkes, senior principal at Technomic. As to why Starbucks chose to open a colossal store in Milan, it shouldn't be a surprise. The new retail model has proven to be a winner for the company. Same-store sales at Starbucks' Seattle-based Reserve Roastery & Tasting Room popped 18% during the fourth quarter, following up on a stellar 24% increase for the quarter ended Oct. 2. The average transaction size at the store was four times that of a typical Starbucks store. People are spending an impressive 40 minutes in the location. The original roastery and tasting room in Seattle opened its doors in December 2014. At a massive 15,000 square feet, the store features a range of higher-end small-lot coffees from around the world, a more expansive menu of food than that found at a normal Starbucks and a giant coffee roasting facility. What Schultz, who will oversee the roasteries closely once stepping aside as CEO on Apr. 3, has planned next for the new concept is sort of mind-blowing. A 30,000-square-foot store will open in Shanghai in late 2017. Some of the building's features will include four entrances, baked goods by the recently acquired Princi and a "world" of Teavana products that also happen to offer loose-leaf tea scooping. Then sometime next year, Starbucks' will swing open the doors to a 20,000-square-foot roastery in New York City's Meatpacking District. It will be on two levels and feature an extended bar that sells and explains high-end coffee and a 45-foot bar dedicated to spirits and mixology. And finally, Starbucks still has plans to unveil a multilevel roastery in Tokyo in 2018. Schultz sees as many as 20 to 30 roasteries eventually in operation around the world. "This is a time in the retail industry where experiences matter so much. We can shine a halo on the entire company based on the unusual experience that customers have inside the roastery," Schultz added. Jim Cramer and the AAP team hold a position in Starbucks for their Action Alerts PLUS Charitable Trust Portfolio. Want to be alerted before Cramer buys or sells SBUX? Learn more now.